These bites make a great little “treat” that has tons of health benefits with zero guilt! Enjoy them as a dessert, snack, before or after a workout, or with tea. They keep well in the fridge so you can eat them over a few days (if they last that long!). This is a simple recipe where you can switch up the ingredients and not measure them out. I recently made these with macadamia nuts instead of cashews, no coconut, and no measuring devices and they were still delicious! Experiment and find a perfect recipe customized for you. Most desserts are sweetened with sugar, but these are sweetened with dried apricots! Not only do the apricots have tons of health benefits, they won’t spike your blood sugar so this recipe is a good choice for diabetics. Apricots are high in an important electrolyte for your body: potassium! A half cup of dried apricots has more than double the amount of potassium than one banana! Cut the carrot into large chunks and chop in a food processor or Vitamix. Remove from processor and make sure it measures out to 1 cup (remove some or process some more carrots as needed) and place in a large bowl. Chop the walnuts and cashews in a food processor, add to the carrot mixture. Chop the dried apricots in the food processor, and add to the carrot/nut mixture. If you have a large food processor you might be able to chop everything at once, I have a “mini” one so I did this in batches. Add the allspice, cinnamon, and coconut to the mixture. Mix with your hands making sure everything is well combined. Using your hands, roll some of the batter into a ball approximately 1 inch in diameter. Then roll the ball in the extra shredded coconut. Repeat until all the batter is gone. Top with a sprinkle of cinnamon. Can be eaten immediately or refrigerated. 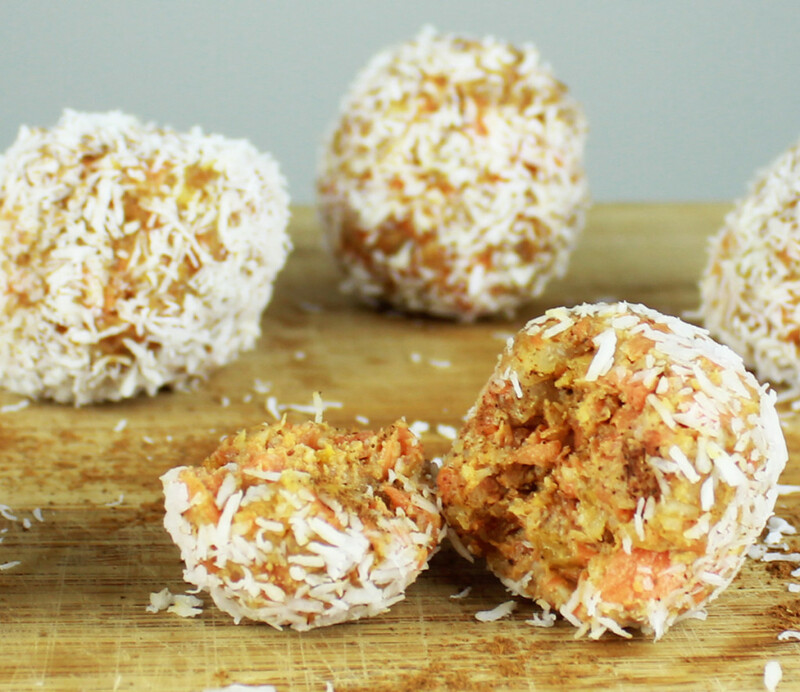 Makes approximately 24 carrot cake balls. Enjoy!